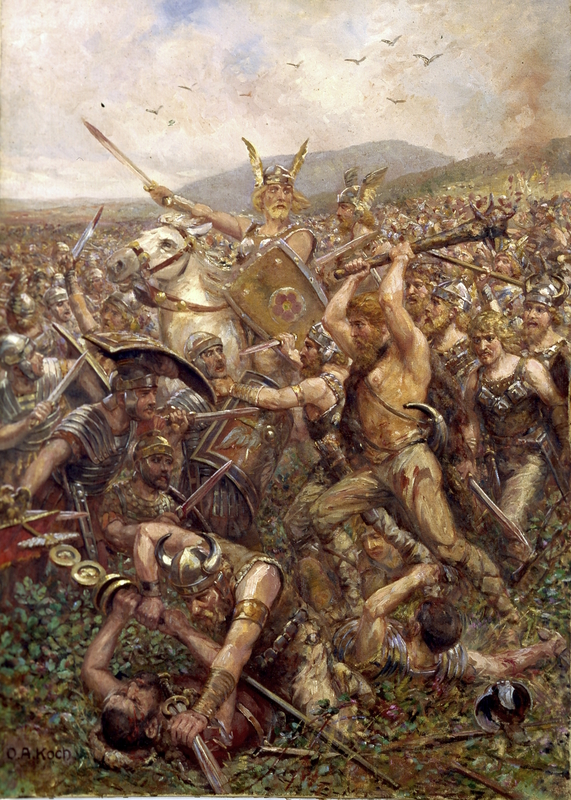 Jen M. asks: What did they do with all the dead bodies after huge battles in history? Given we know that even Neanderthals would bury their dead (even including objects with the bodies) and various human hunter-gatherer groups likewise used to bury or cremate people at specifics sites that functioned as sort of pilgrimage locations for these nomads, it should come as no surprise that since the dawn of known warfare soldiers have pondered the question of what to do with the bodies of their fallen comrades and enemies. So what did various groups actually do throughout history? A thing to note before we continue is that there is a definite gap in the memory of history in regards to this one specific matter and historians only have sparse reports of what happened to the dead of many groups after battles. You might think solving this problem would be simply a matter of locating famous battle sites and doing some digging to glean a little more insight, but it turns out even this is notoriously difficult as we’ll get into shortly. That caveat out of the way, on the more definitive front, it’s noted that the ancient Greeks made an effort to respect the usual burial customs of the dead after a battle and collecting the bodies of the fallen wasn’t uncommon. For example, following the Battle of Chaeronea in 338 BC between Philip II of Macedonia and the Athenians, both sides buried their dead in accordance with the religious customs of the period; this was seemingly done both out of respect for the valor the dead showed in battle and to appease the gods. With the exception of the Spartans, most ancient Greek societies also made efforts to bury their dead near the city they hailed from if time allowed it, though for the sake of practicality, mass graves or the like were sometimes utilised instead. In this case, cenotaphs were sometimes erected near their home city in honor of the fallen. As noted, an exception to this are the Spartans who often buried fallen soldiers on the battlefield they were killed. Also somewhat unique was that rather than stripping the dead of valuables, as per Spartan tradition, each fallen Spartan was buried with their weapons and armor and their final resting place was marked by a simple tombstone with their name and an inscription that read (translated) “In War”. This was a special honor among the Spartans. If one were to die outside of battle, no such tombstone would be given and the person would simply be buried in an unmarked grave. The one exception to that was if a woman died in child birth, she too would be given the honor of a tombstone. As for the Romans, most soldiers paid a small stipend each month to pay for funeral expenses should they fall in battle. As you might expect from this, the Romans made a conscious effort to recover the bodies of those who died and, if time allowed it, would bury or cremate them individually. If this wasn’t possible, the bodies of soldiers killed in battle would be collected and given a mass cremation or burial. In the event the bodies couldn’t be recovered, a cenotaph would be erected to serve as a monument to the individual. The same cannot be said of later wars where there seems to have been an almost callous disregard for the fallen, and looting of the dead and dying was commonplace. For example, the Bayeux Tapestry depicting the Battle of Hastings in 1066 shows soldiers piling up the bodies of the dead and stripping them of their valuables. It’s believed that following this the bodies were quickly cremated or buried in nearby mass graves. It should be noted here, however, that with the rise of Christianity, mass cremation, at least for a time, seems to have gone the way of the dodo in some regions, in favor of mass graves. The ground between the wood and the Russian batteries, about a quarter of a mile, was a sheet of naked human bodies, which friends and foes had during the night mutually stripped, although numbers of these bodies still retained consciousness of their situation. It was a sight that the eye loathed, but from which it could not remove. And yes, as noted there, the severely wounded weren’t spared the indignity of being robbed of their worldly possessions as they lay dying. And worst of all, this was done not just by their enemies, but comrades as well. In fact, there are firsthand accounts from wounded soldiers who went on to survive their injuries detailing the shock of waking up completely naked. Stretched on the snow among the piles of dead and dying, unable to move in any way, I gradually and without pain lost consciousness…. I judge that my swoon lasted four hours, and when I came to my sense I found myself in this horrible position. I was completely naked, having nothing on but my hat and my right boot. A man of the transport corps, thinking me dead, had stripped me in the usual fashion, and wishing to pull off the only boot that remained, was dragging me by one leg with his foot against my body. The jerk which the man gave me no doubt had restored me to my senses. I succeeded in sitting up and spitting out the clots of blood from my throat. The shock caused by the wind of the ball had produced such an extravasation of blood, that my face, shoulders, and chest were black, while the rest of my body was stained red by the blood from my wound. My hat and my hair were full of bloodstained snow, and as I rolled my haggard eyes I must have been horrible to see. Anyhow, the transport man looked the other way, and went off with my property without my being able to say a single word to him, so utterly prostrate was I. It should also be noted here that beyond any possessions the bodies may have had on them before being stripped, the bodies themselves were also of value. For example, human scavengers would come through and rob the dead of their teeth, which would then be used to make dentures. The Napoleonic Wars, and in particular the Battle of Waterloo, were such a boon to the British dental industry in this way that dentures were known as “Waterloo teeth” in the UK over a decade after it ended. Teeth from soldiers were highly sought after owing to predominately coming from relatively young men who still had reasonably good teeth, unlike many others that came from the more wizened dead. Upon asking this Butler, who appeared to be in a state of great destitution, what might be his object, he said it was to get teeth…but when I came to question him upon the means by which he was to obtain these teeth, he said, ‘Oh Sir, only let there be a battle, and there’ll be no want of teeth. I’ll draw them as fast as the men are knocked down. It is now ascertained beyond a doubt, by actual experiment on an extensive scale, that a dead soldier is a most valuable article of commerce; and, for aught known to the contrary, the good farmers of Yorkshire are, in a great measure, indebted to the bones of their children for their daily bread. It is certainly a singular fact, that Great Britain should have sent out such multitudes of soldiers to fight the battles of this country upon the continent of Europe, and should then import their bones as an article of commerce to fatten her soil! Moving across the pond and slightly more recently in history, markedly more respect was shown for the dead during the American Civil War where teams of soldiers were tasked with burying the dead of both sides in simple mass graves, with great care being taken to ensure most soldiers received a proper burial. Finally, to discuss WW1 and WW2, individual units were largely responsible for the disposal of their own dead with both Axis and Allied forces having their own rules for how this should be handled. For example, during WW2 Colonel Walther Sonntag of the Wehrmacht’s Casualty Office issued a comprehensive guide for military graves officers detailing how mass graves should be constructed. Amongst other things the guidelines indicated that mass graves should be made as close to railway lines as possible and feature pathways with the intention being that they’d eventually be turned into war cemeteries. As the war raged on, these guidelines were largely ignored for the sake of practicality, leading to, as Der Spiegel puts it, “a surfeit of grave steles”. As for the Allies, during WW2 burying the dead largely fell to individual soldiers, but some units dedicated to the task did exist, for example the United States Quartermaster Graves Registration Service. Tasked with finding and burying every fallen American soldier, the Quartermaster Graves Registration Service have been hailed as some of the unsung heroes of the War due to the general lack of recognition they’ve received since it ended. Graves Registration units were exceptionally committed to their task and undertook their duties with a solemn sense of duty and determination, going to extraordinary lengths to identify bodies and perform the appropriate burial rights depending on the fallen soldier’s religious affiliation. When appropriate, GRS units would bury civilian, allied and axis casualties they came across, making sure to bury them in well-marked graves, the locations of which would be passed onto the relevant authorities. Were the pulverised bones of soldiers and horses who died at the battle of Waterloo sold as soil fertiliser? I worked for the Australian Department of Veterans’ Affairs. One of my clients wrote about how he was detailed, during the North African campaign, to bury the Italian dead. This meant collecting the bodies, identifying them, if possible, and having an Italian chaplain P.O.W. perform the funeral ritual. If the bodies had been dismembered by shell fire, they had to collect the severed arms and legs and join them next to the body, if possible. It was not a pleasant task.